I probably should have known better than to go to this typical Staatsoper revival with Roberto Alagna and Norah Amsellem, but I did anyway. Allow me to advise you of its content before you let this happen to you. Andrei Serban’s production seems rather interesting, but what is onstage is more an impression of a production than a production. Musically things were plausibly French, but they were not plausibly very good. Massenet, Manon. Wiener Staatsoper, 5/16/2011. 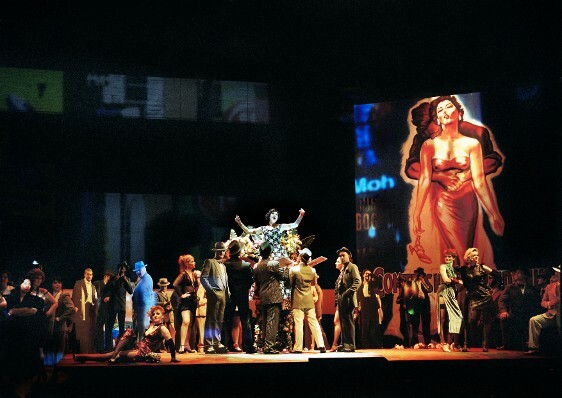 Production by Andrei Serban (revival), conducted by Jesús López-Cobos with Norah Amsellem (Manon), Roberto Alagna (Des Grieux), Tae Joong Yang (Lescaut). With the right Personenregie and casting to go with this atmosphere, I could see it working pretty well, but it didn’t come together this evening. The Manon/Des Grieux scenes are intended to be intimate while the bigger ones are more stylized and choreographed, but both were messily executed. I got the impression that bits like the Act 2 guardsmen were actually originally witty, but only a few hints of this remained. (They had around four or five days of rehearsal for this, we have documented proof.) Also, it is except for the movie posters monochromatic, but apparently all Staatsoper productions are like this. 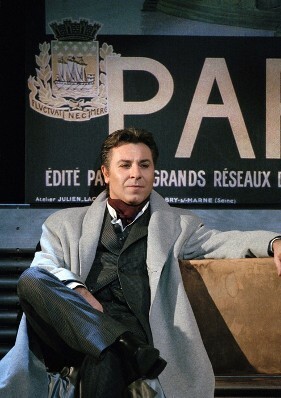 Some atmospheric melodramatic old movie-style acting was still had from Roberto Alagna (who sang in the premiere of this production a few years ago), but for the most part it was generic. The biggest problem was Norah Amsellem’s Manon. The production is designed for a Manon with a confident, modern sexuality (who could this have been? hint: she suffered a wardrobe malfunction in front of the German press earlier this week) but prim and thoroughly unglamorous Amsellem doesn’t seem the type to leave a half-full wine glass next to her bed, or to stumble around in Act 5 in a full-length beaded evening gown. She went through the motions, but something was missing; a more conventional romantic interpretation may have worked better for her. Manon is a problematic character who is pretty much going to annoy me no matter what, but this didn’t seem to be a way of solving the problem. Amsellem’s singing was stylistically strong but her thin, quavery tone is not easy on the ears, her coloratura is poor, and she held the high notes in the Cours la reine for a lot longer than I wanted her to. After I gave them credit for being good just recently, the orchestra was at its worst and turned in a very sloppy and unbalanced performance. Jesús López-Cobos’s conducting lacked flexibility and rhythmic life, as well as those coordination issues. The supporting cast was OK but uninspired. Extra credit, however, for Caroline Wenborne as Javotte’s delightful little dance break at the very end of Act 3 Scene 1. I like this production very much and Netrebko inhabited the role. Serban sees Manon as being on the road to ruin from the start, lifting a necklace from one of the three whores early on. I'm not surprised about Amsellem, who seems more at home in lyric roles and has one character which isn't this one.. Alagna's looking long in the tooth but he can still project (when he isn't singing sharp–did that happen?). Back to youtube! Donna Anna, I saw her put the necklace on but missed her stealing it! That's the kind of detail that gets totally scrambled in these revivals. Alagna did project just fine (albeit with a raw edge to the sound), it was when he tried to sing quietly that things got rough. Intonation was pretty good, though. Zerb, what a great observation that Alagna really works the "youthfully impetuous" portrayal like no other, despite the fact that he's pushing 50? This goes so far as him flirting outrageously with the HD interviewers. I really find his boyishly charming schtick endearing, and wonder how he can keep it up, year after year. Ivy, I also find him endearing. His Nemorino was one of the first operatic performances I remember being struck by specifically (with Angela's authentically pushy Adina, they are perfect) so he kind of has a special place in my heart. It's good that he's a tenor, because this thing would not work for any other Fach. I saw both him and Kaufmann as Don José at the Met last season and it was striking how much younger Alagna's José seemed, despite him being the older of the two by quite a bit.